In the 1950's amethyst deposits were discovered about 30 miles NE of Thunder Bay Ontario while building a road. Since the 1960's it has been mined in the area. The amethyst from Thunder Bay can range from light, delicate purples to almost black in color. 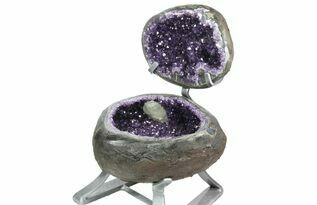 One very distinctive characteristics of many Thunder Bay amethyst crystals is the the inclusion of red hematite (microscopic disks/spherules within the amethyst). These inclusions can cause crystals to have red highlights, zones or even appear completely red in color.